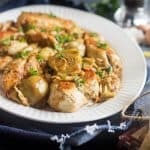 I was just thinking how often chicken dishes are on our weekly menu and how seldom I share those recipes. Must be because I think they’re not special enough. You know, you throw some chicken in the oven and call it a day. Easy dinner choice and if I change vegetables and side dishes, no one notices I’ve been serving the same chicken dish all week long, ha! 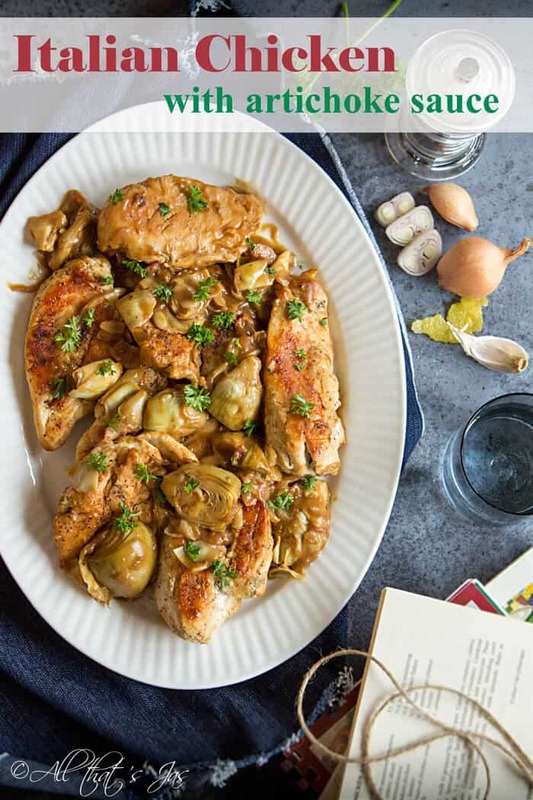 My go-to recipe is my mama’s roasted chicken and as of recently, this garlic lemon chicken. I love the tender, juicy chicken and crispy skin but my doctor told me I should avoid the skin. He says he doesn’t like my cholesterol levels. I say I can’t be preserved forever. Cut the larger chicken breast pieces in half crosswise. In a medium bowl, combine 1 tablespoon oil, lemon zest and 1 tablespoon lemon juice. Add chicken and turn to coat. Marinade for about 30 minutes. Whisk flour and broth in a small bowl; set aside. Remove chicken from the marinade; season the chicken evenly with salt and pepper. Heat the remaining oil in a large skillet over medium-high heat. Add chicken to the pan and cook about 5 minutes on each side or until juices run clear. Remove chicken from pan and keep warm. Reduce heat to medium. Add pancetta, shallots, and rosemary; cook until shallots are tender, about 3 minutes. Add garlic and cook until fragrant, about 30 seconds. Add wine to the pan and cook, deglazing the pan, until liquid almost evaporates, about 5 minutes or less. Stir in broth mixture and bring to simmer. Add artichoke hearts (thawed if using frozen) to the pan. Cook until sauce thickens slightly, about 2 minutes. Stir in remaining lemon juice and parsley. Add chicken to the pan, turning to coat. Sprinkle with more parsley if desired. Serve with rice or pasta to sop up the rich sauce. 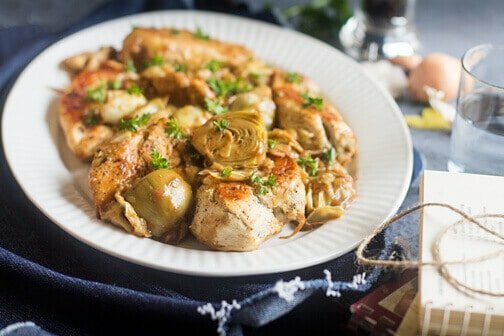 Chicken breasts with artichokes, pancetta, and white wine make this Italian dish with exceptional flavors. Beautiful Chicks and Chocks as my family calls it with beautiful flavors, stunning photography. 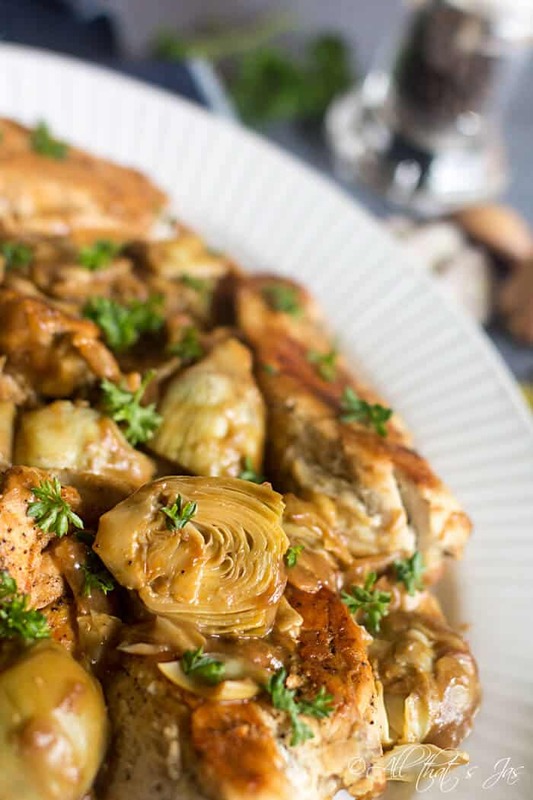 Adding this recipe to my Chicken a Bizillion Ways board! I wanted to send you an e-mail as I wanted to touch base with you but I don’t have this. Sending a virtual hug your way. You can reach me at bobbi@bamskitchen@gmail.com. I am here for you any time, my friend! Thanks, my friend, I really appreciate that! I can be reached at allthatsjas1@gmail.com. I like the Chicks and Chocks name 🙂 Have a blessed day! 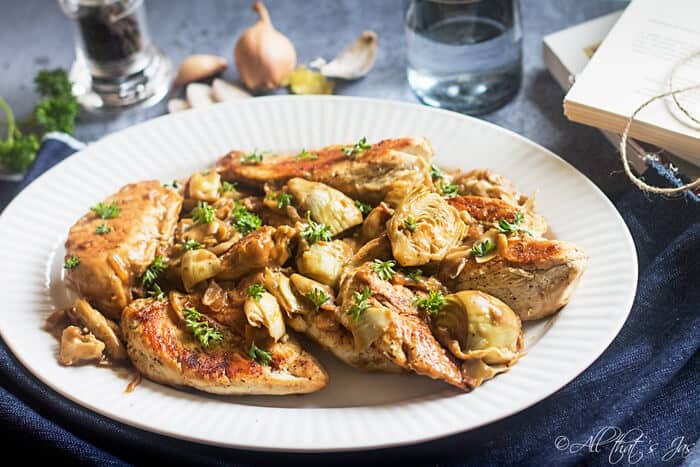 Chicken is most often chosen meat in my household too; Recipe sounds and looks mouthwatering! It’s the easiest and i never get tired of it 🙂 Thanks, Jasna and have a lovely day! Aw, thank you Kathy! 😀 Please let me know how it turned out for you!!! Have a great day and thanks for stopping in. Oh my gosh, the chicken turned out great! Everyone loved it. I’ll definitely be making this again and again. YAY! *jumping up and down. I’m so glad you loved it 😀 Thank you for trying it out and have an amazing weekend, Kathy! That dish looks so good! Thanks for sharing with us! Thanks for stopping in, Denise! Have a great weekend. This looks delicious!!! I’ll be trying it very soon! This is a winner in my book. Can’t wait to make it for a dinner. Pinned & shared. Thanks for joining the Inspiration Spotlight party! Have a great weekend & see you again soon. Hi, Kathryn. Yes, that is an old trick – change the sides and you have a “new” dish, lol. Thanks for stopping in!!! This chicken looks so moist and flavorful! Yum, and the artichoke looks absolutely amazing. Never thought to do this before now! I need to try! Thank you so much for sharing with us at #ThrowbackThursday, can’t wait to see what you bring this week! Thank you bunches, Alli! Have an amazing week! Hi Jas! Guess what! I loved this post so much that I chose it to be featured for this week’s The Beautifully Creative Inspired Link Party. 🙂 Go grab a button you deserve it! Yay! Thank you, sweetie 😀 I’m so glad you like it!